Pour your favorite shampoo in this 5 gallon pail and fill with water to wash your vehicle. The high density polyethylene makes the bucket very durable so you can use for years to come. It has a very strong metal bail with a plastic handle that makes carrying it comfortable and easy. If you have a Grit Guard it will lay flat on the bottom of the bucket. 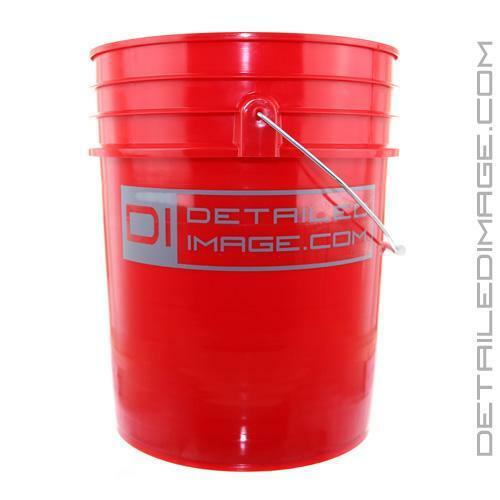 This bucket also has our DetailedImage.com sticker on it so everyone knows it is your detailing bucket. It's available in multiple different colors as well. Get a top quality bucket today that you can keep for years and years! Bought the Red for wash, and Blue for rinse, work fine for me. Deep blue, most detail sites sell black, red & white. Good product, waiting for blue Gamma seal lid. Amazing, high quality bucket. Now have my logo on them.